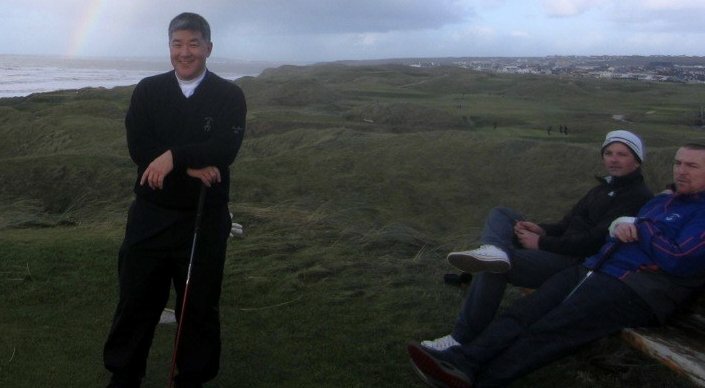 Dan Tani, an American reader, joined Ballybunion as an overseas member in 1998, when the cost was next to nothing. This year the weather was beautifully clear and calm, but a bit chillier than last year: the car reported a temperature of -2C when I pulled into the car park. In my attempt to maximize my golf, I had left Cork in pitch dark, at 7:00 a.m., and I pulled into Ballybunion at 9:30—perfect timing, I thought. There were very few cars in the lot, and just a few people milling around. As we waited for the greens to thaw, I sat in the clubhouse and had coffee with several members, including the club co-captain. 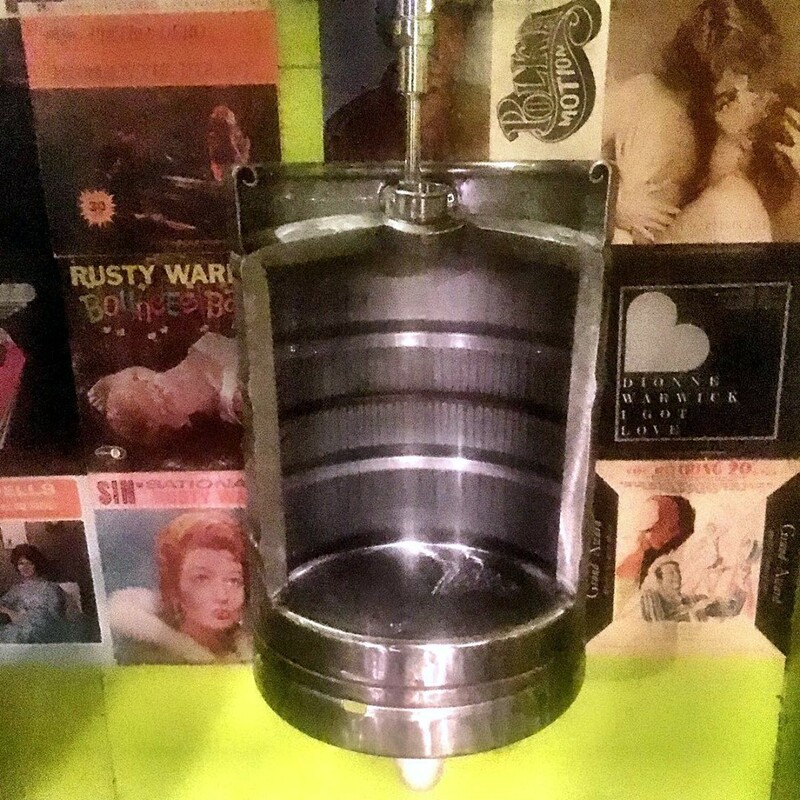 More than half the guys in the bar were named Costello, although they were not all related. We all became amateur meteorologists: looking out the windows, studying weather maps on our cell phones, estimating sun angles, analyzing temperature gradients. The only real concession the club makes to winter is to take the fairways out of play. Last year, you had to lift any ball in a fairway (rare in my case) and drop in light rough. That let the fairways to rest over the winter, but I guess it ate up the light rough, so this year we had to use mats. A positive aspect that I did not initially appreciate is that, when mats are used, winter rounds are considered “official” for tournament purposes, and so count toward handicap. This winter, there was also a temporary green on the 18th. 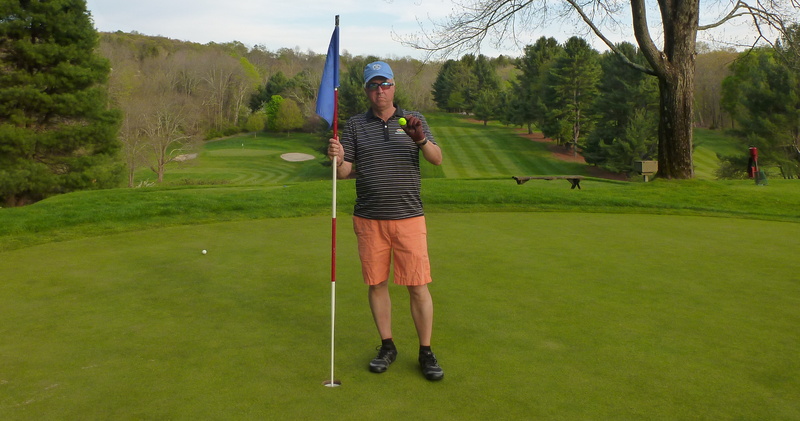 It made the hole disappointingly shorter and easier—although in my case I plugged my approach shot in the face of the huge “Sahara” bunker and had to play backward, into the same bunker, just to have a shot out. 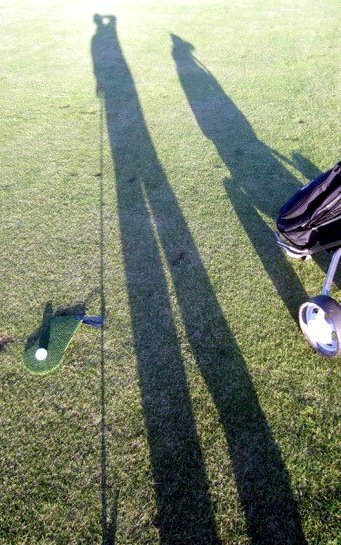 One of the things that make Irish winter golf extra dramatic is the long shadows. Ballybunion is roughly 60 degrees north latitude, and when the sun at its southernmost position the highest it ever gets is about 7 degrees above the horizon. That makes for extra-long shadows even at noon. Failte Ireland, the Irish tourism authority, has created what it calls the Wild Atlantic Way, a 2,500-kilometer motor route along along some of the most beautiful coastline in the world. It passes through most of the country’s most famous western and southern coastal sites: the Burren, the Cliffs of Moher, Connemara, the Ring of Kerry, and many others. It also connects some great golf courses: Ballyliffin, Carne, Rosapenna, Donegal, Sligo, Lahinch, Doonbeg, Tralee, Waterville, Old Head—and of course Ballybunion. I’m sure it will bring many more tourists to this out-of-the-way part of Ireland, for good and bad. As a matter of fact, my friends and I may be traveling part of that route a year from this coming spring—for good only, of course. Seventh hole, Old Course, Ballybunion, Ireland. 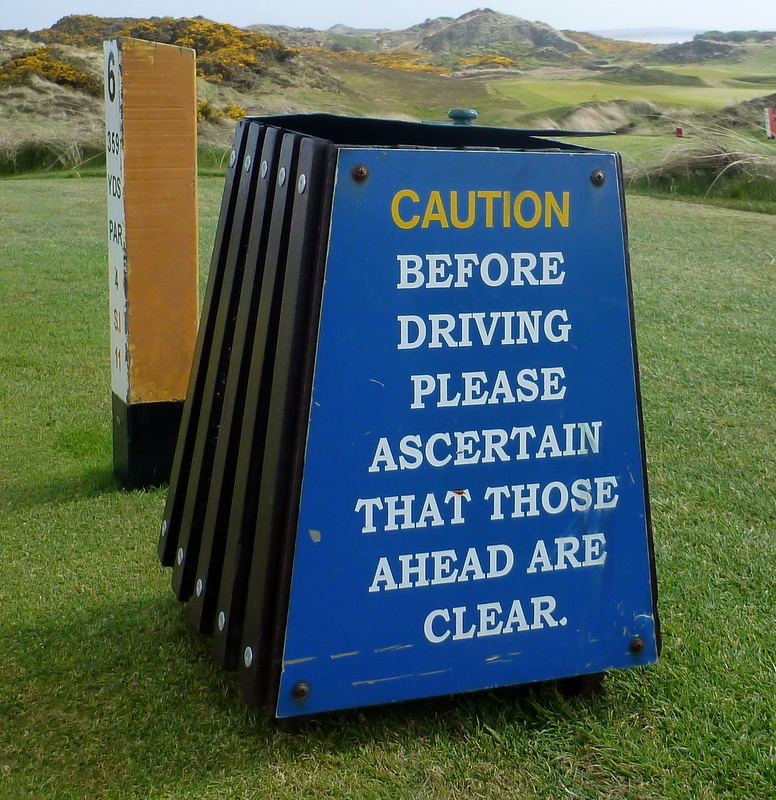 American golfers often speak of the Old Course at Ballybunion as though it were the only golf course in Ireland, so when I first visited, in 2006, I was predisposed to be underwhelmed. After actually playing it, though, I realized that it belongs right where it’s always listed, with Royal County Down and Royal Portrush and, therefore, with the greatest golf courses not only in Ireland but also in the world. At least half the holes would stand as the best hole on any number of very good courses. I could have played Ballybunion until immigration officials (or my wife) came to drag me away. 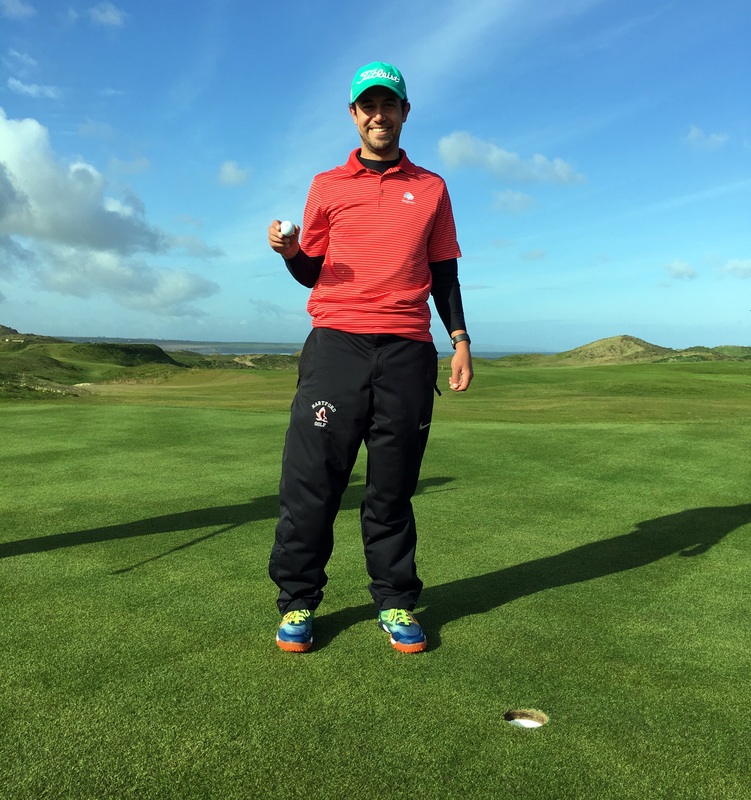 Dan Tani, seventeenth tee, Ballybunion, December 30, 2013. That’s Jeremy and Anthony on the bench. (Dara took the photo.) 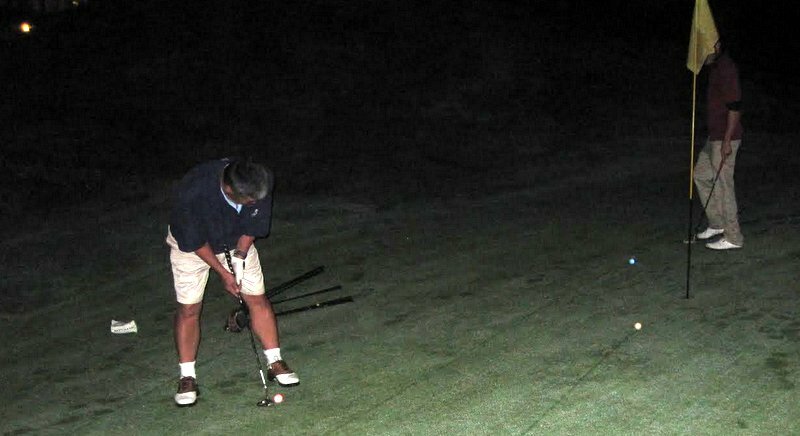 Rainbows are officially disallowed in golf-course photos published on this website, but every once in a while one slips past the censors. Dan Tani, an American reader (photo above), joined Ballybunion as an overseas member in 1998, when the cost was next to nothing. Two years later, he married a woman from Cork, and so now is obliged to visit twice a year. 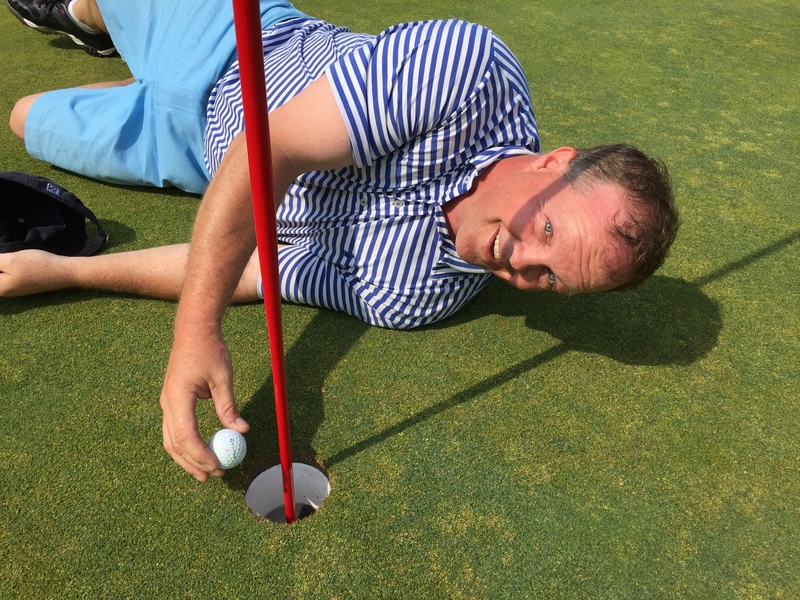 (He proposed at the stroke of the millennium, after playing Ballybunion in the afternoon and rehearsing his lines on the drive home.) Ever since, he’s made a point of playing at least one round very late in the year. This past December, he played on New Year’s Eve Eve—December 30, 2013—with three Irish guys whose fourth had exceeded the legal limit on showing up late. 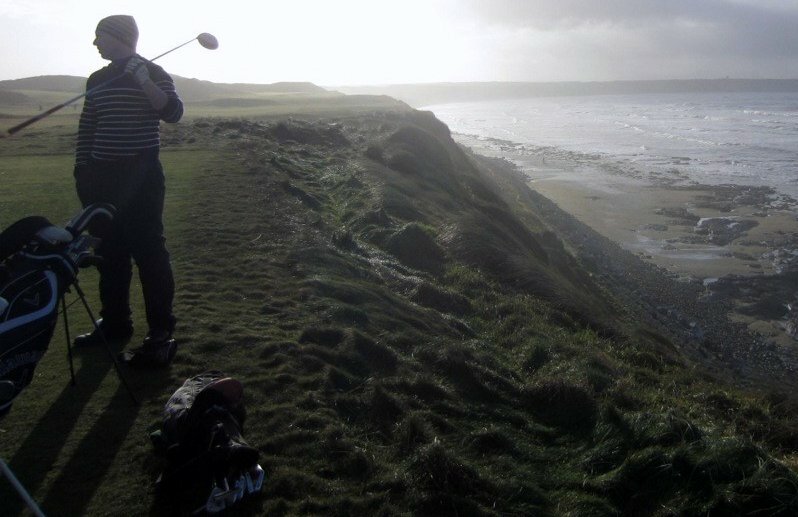 Seventeenth tee, Ballybunion, December 30, 2013. 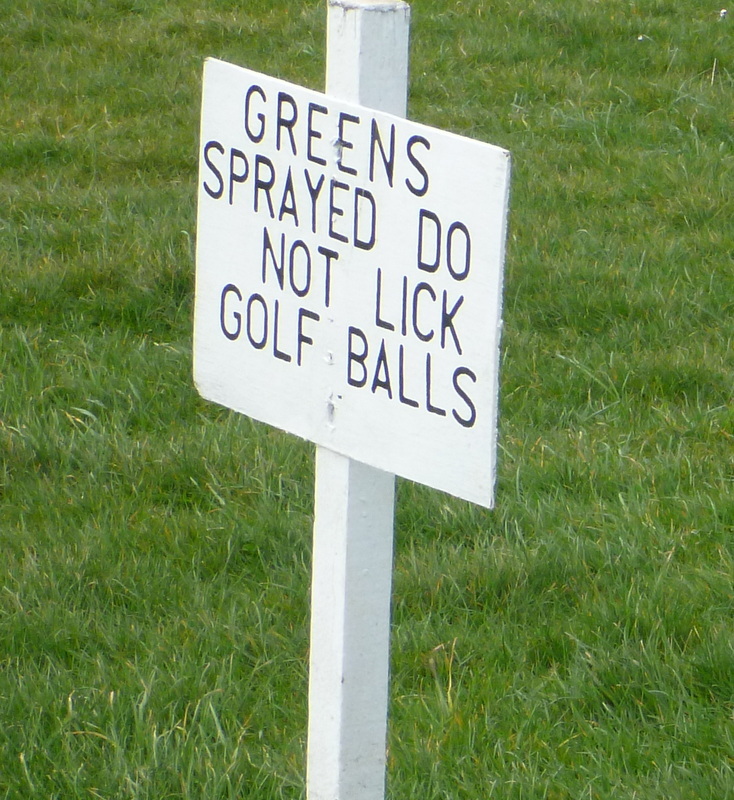 Golf in Ireland in December can be wet and cold, but it can also be surprisingly mild. I’ve played in short sleeves and in full winter rain gear. This year, it was cool—about forty degrees, but dry, clear, and sunny—and the wind was only about ten miles an hour. I joined Anthony, a local publican, hotelier, and landscaping-company owner; Dara, a former assistant pro at Ballybunion, now an accountant in Dublin; and Jeremy, a greenkeeper currently working on a new course in Finland. They were old friends from years ago, getting together over the holidays. 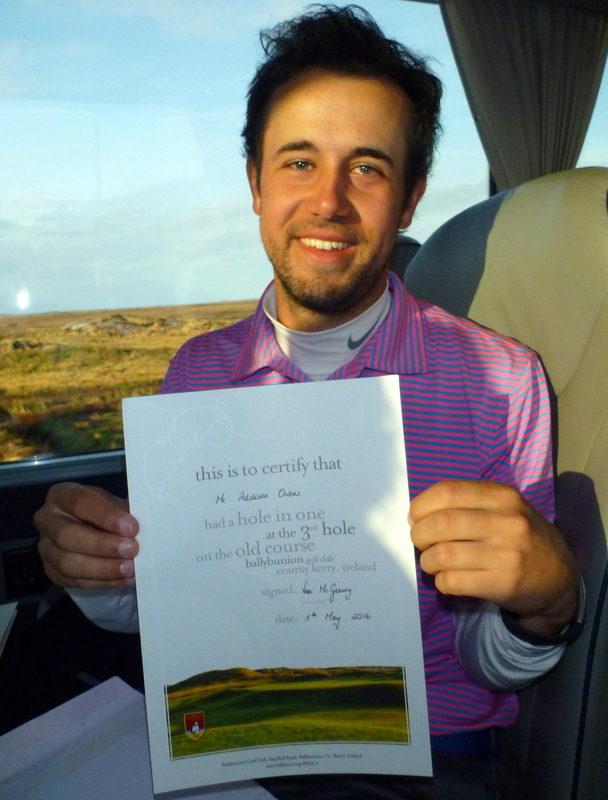 Dara is from Newcastle, Northern Ireland, and he grew up as a member of Royal County Down. He had a beaten-up golf bag with the R.C.D. 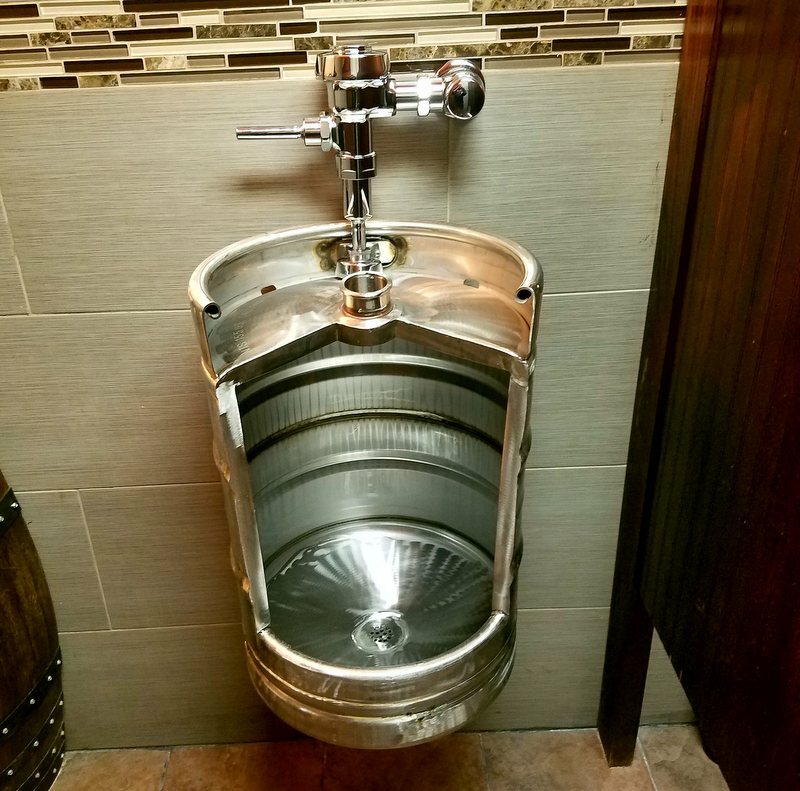 logo on it. Dara and his R.C.D. golf bag, seventh tee, Ballybunion, December 30, 2013. 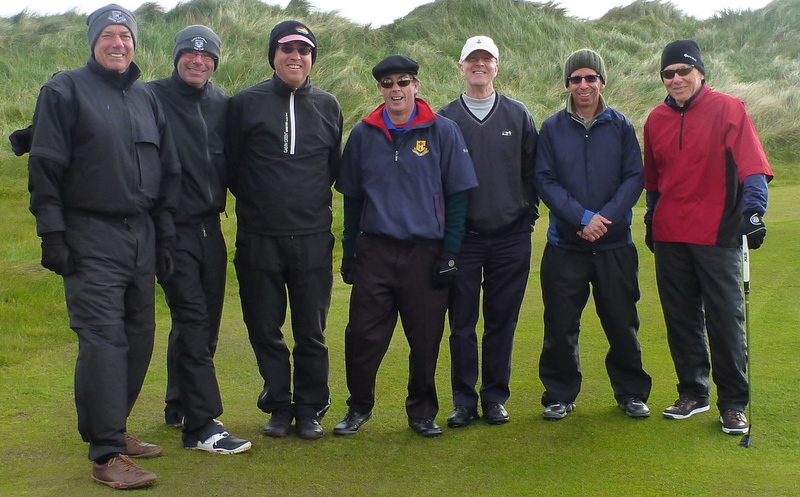 One thing I have noticed when I play Ballybunion is that I am always the oddly dressed golfer on the course. If I wear beaten-up clothing with various golf clubs’ logos, I end up playing with three guys in full Ballybunion gear: jackets, hats, etc. This time, I wore my Ballybunion sweater, and, of course, the other guys were dressed like they’d just rolled out of bed: tattered pullover sweatshirts, Converse sneakers, jeans. I envied them and wished I could be cool enough to shoot even par in sneakers and pub wear, too. 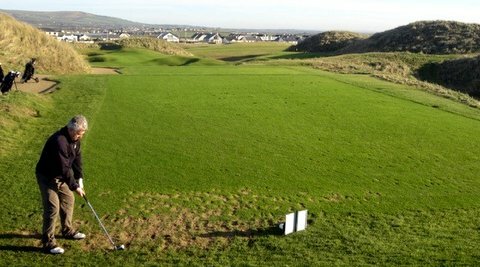 Eighteenth tee, Old Course, Ballybunion, Ireland, December 30, 2013. That’s the seventeenth green in the foreground. The eighteenth fairway is at the far right, receding into the distance, toward the clubhouse. Tani indirectly makes a point that I myself have made before: rather than going to Myrtle Beach for winter golf, why not go to Scotland or Ireland? The weather is often worse in Myrtle Beach. Anyway, here’s one more rainbow shot, as long as we’ve broken the rule. Tani took this one from his car on the way to the course.